Welcome to the Leehan Home Page! This site is dedicated to the ancestors and descendants of Daniel Leehan of Ireland and Pennsylvania, to the families with whom they intermarried, and to the people, places, and institutions they loved. Daniel Leehan was my great great grandfather. He emigrated from County Cork with his infant son Matthew (my great grandfather) a few weeks after the death of his first wife. 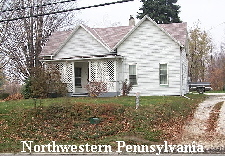 They settled in Northwestern Pennsylvania where their descendants have suffered and prospered to the present day. On this site you will meet these people and the families whith whom their intermarried. We have Kearneys, Carberries, Shippens, Shacks, Mitchels, Bristols, Hamiltons, Einsidlers, Santinis, Ferrantes, Tyrones, Ventriglias, and scores of others. We also have presidents, kings, popes, and other historic personages whose lineages have crossed these at one time or another. There is a seperate database dedicated to all those carrying one of the Le(e)han(e) surnames and their immediate relatives. This section lacks the extensive intermarriage trails of the “Leehans and Others” database, but includes and attempts to interconnect all Le(e)han(e)s we could find in census, directory, and other public sources. A third database is dedicated to ALL the families who, like the Leehans, settled in Northwestern Pennsylvania. It currently includes all folks who were counted in Albion, Cranesville, Conneaut Township, or Elk Township in the 1800s and 1900s. We hope it will someday encompass Springfield and parts of Crawford County as well. We have photo Albums where you can see pictures of some of these folk, and perhaps even a video or so. We have Books and slide shows written by and/or about these folk and their activities. We have information and links to more information about the places (like Albion, Pa, and Inchageelah, Ireland) and institutions (like the B&LE Railroad) that figured prominently in their lives. Browse our Web site for more information. If you have any questions, please e-mail us at gwleehan@patmedia.net. .We also now offer Tree On a Stick...An all purpose Genealogy Program, Website creator, and portable database archie on a gigabyte USB memory stick. Check it out if you’re intrested.